Tags: Headlines, High Response, Sales Letters Secrets. 1. Pull — don’t push. Pull prospects inside with an alluring appeal, instead of pushing your product upon them. Online prospects are in complete charge of their experience. You cannot contain your visitors with multiple pop-up windows in an attempt to keep them at your site. That will only frustrate and annoy the very people you want on your side. 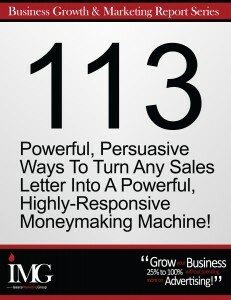 The only way to keep prospects there reading your sales copy is to give them more of what it is they want. In the online world, it’s the recipient (the prospect) not the sender (the vendor) that controls the sales presentation. 2. Respond immediately to all inquiries from your website the same way you’d respond to incoming calls on the phone. Make it an absolute rule to respond within 24 hours – sooner if you can. Your customers expect you to take their inquiry seriously and to answer promptly and professionally. The sooner you reply, the more you’ll impress your prospect. This doesn’t mean that you need your email program open 24 hours a day. It means periodically and regularly blocking out chunks of time to reply to every message from a potential customer. Responding in a timely manner sets you apart from many other business owners who don’t understand the importance of good service before the sale.